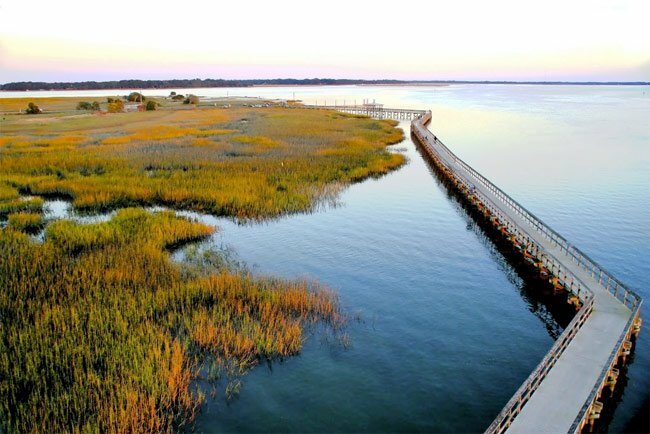 Sands Beach borders the southern portion of Port Royal, where Battery Creek flows into the Beaufort River. The beach was created from dredge spoil when the State Ports Authority built a terminal here around 1958. Although SPA recently closed this terminal, the beach it created remains a beloved part of the community. Since its creation, “The Sands,” as it’s called, has offered an opportunity for visitors to access a beach without having to travel too far from home. The beach found here is unique in that one can drive almost directly up to it, which makes it a great option for the physically impaired. Shark teeth and shells are abundant here and are popular among those searching for a surprise. 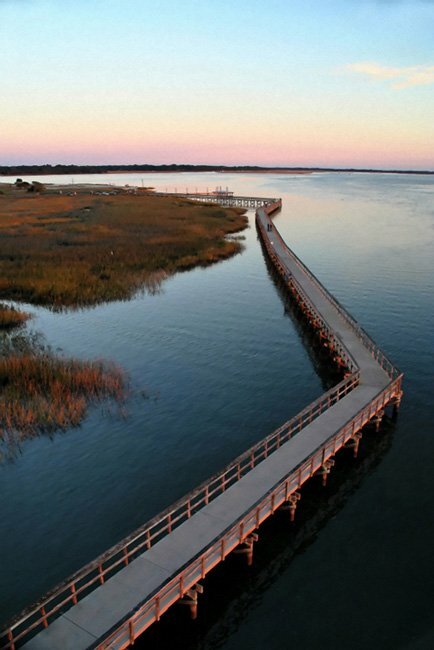 The boardwalk at Sands Beach is known as the Henry Robinson Boardwalk, named for Port Royal’s former mayor, who retired in 2011. 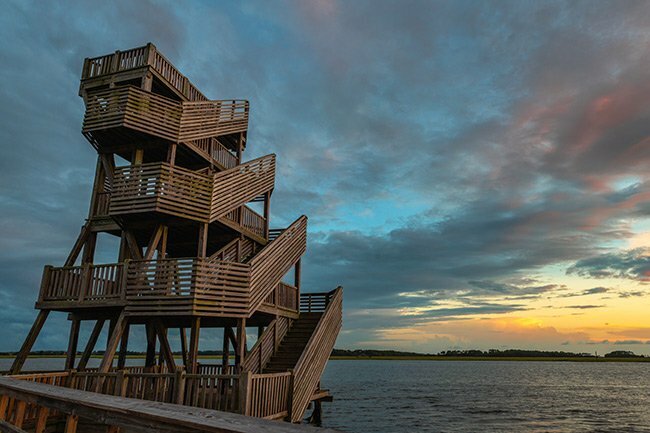 Stretching a half-mile mile along Battery Creek, the boardwalk offers fantastic fishing, photography, and wildlife viewing opportunities. 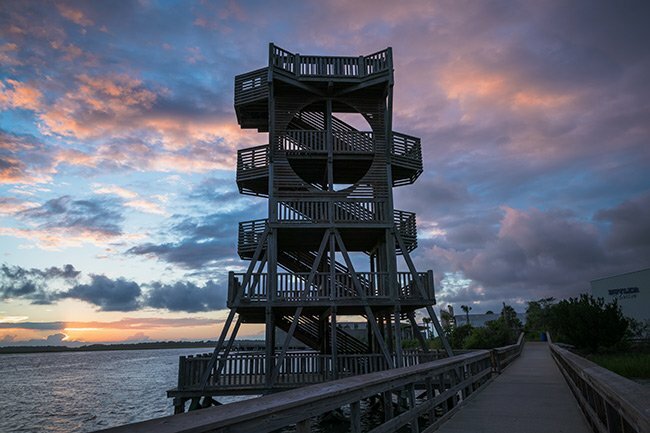 At one end, an observation tower offers exquisite 360º views of the surrounding landscape. 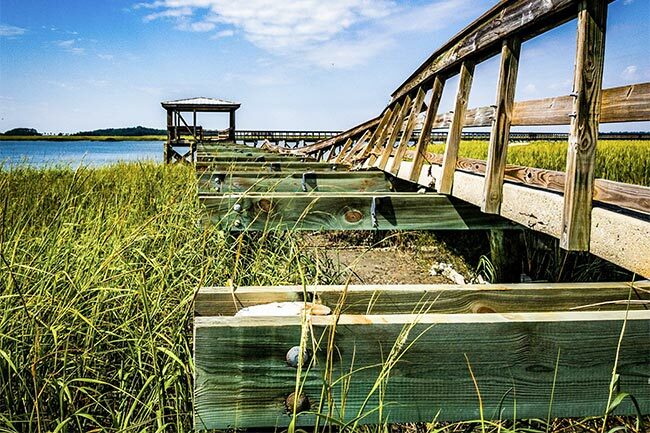 In September of 2017, the boardwalk was badly damaged by the force of Hurricane Irma. When repairs were made, wooden slats were used in place of concrete to allow the structure to be more permeable. 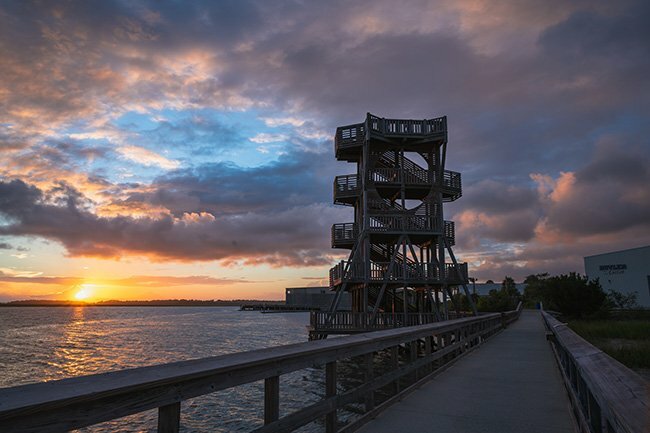 The cost of the project totaled nearly $130,000, and the popular landmark closed for two months while repairs were made. The boardwalk is now in excellent repair and one of the most popular destinations in Port Royal. Sands Beach is open every day of the week during daylight hours. “When I was a child, the beach created a fantastic playground for exploration and provided me with an ample supply of sharks teeth and other fossils. The dredged sand created a perfect swimming area for the local kids and we spent many nights camping on our ‘private’ beach. “Around 1960 the US Navy landed a large LST (ship) near the spoil area to offload supplies for Parris Island. Up to this time, the point was inaccessible to vehicles and access was limited primarily to us kids who didn’t mind wading through shallow water and a narrow area of pluff mud to reach our ‘private’ playground. “But life changed and when the Navy finished their exercise left a road and narrow causeway over the low-lying area, which opened the beach up to automobiles. 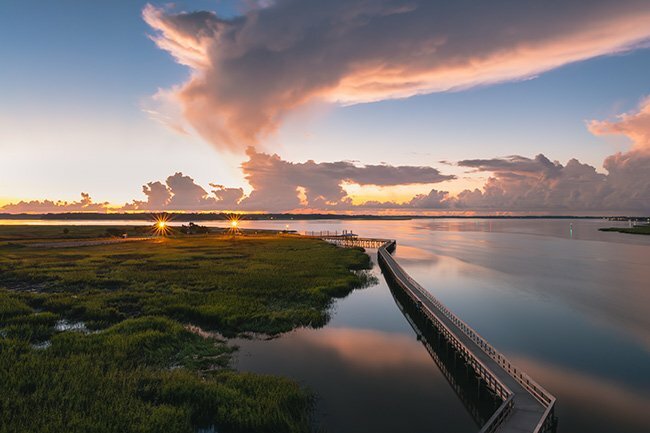 “My dad and other fishermen were quick to take advantage of the road and ramp left behind, and in a short time it was transformed into a boat ramp. As its popularity increased, the ramp became a favorite with teenagers and young marines as the smooth waters of the adjacent Battery creek provided an ideal site for waterskiing. And what goes hand-in-hand with water skiing? Sunbathing of course, and the sands became a popular site (and an alternative to the 20-mile drive to Hunting Island beach) for sun-worshipers. “Despite the erosion and settling of the dredged sand, the beach remains popular with sunbathers to this day. 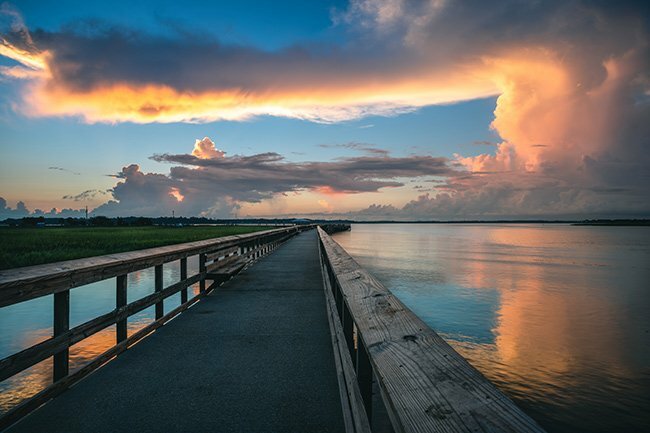 Eventually the county paved the old sand and rock boat ramp, and today it is one of the premier boat ramps in Beaufort County. 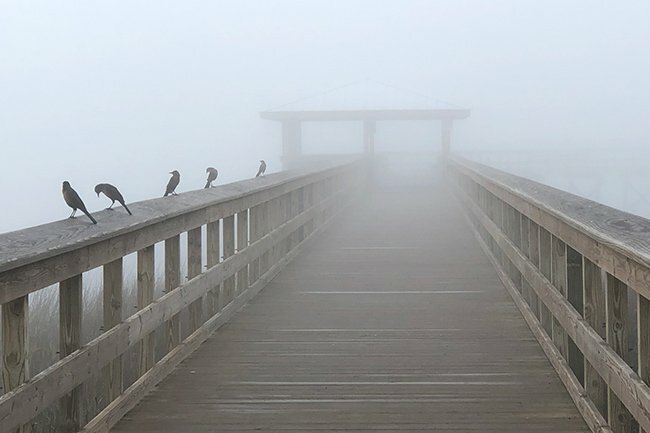 “I’m unsure when the boardwalk was constructed, but it provides an excellent site for a leisurely scenic stroll to enjoy the water, and fishing and crabbing are popular activities. Hey Tony, we will forward your contact information along! I would like to contact Barry Gooch, by email. I knew him back in the 50s when my dad was stationed at Parris Island. I am the guy who tripped on and exposed that sword that he got. Wondering the distance by water from Sands to the Parris Island bridge, please? Are weddings held at the Sands? Does anyone have a phone number for the the Shark’s Tooth Hunt coming up in October?